Show your wife just how great of a guy you are by surprising her with your new trick -- cleaning your wedding band with beer. For a lot of guys, cleaning a wedding band is generally the last thing on your mind. This simple way of cleaning your wedding ring presented by Underwear For Men boxer briefs is sure to impress your loved ones. Kill two birds with one stone -- clean your wedding ring and don't use too much energy in doing so. For minimal effort, you'll impress your spouse and boost the appearance of your most important piece of jewelery. How long has it been since your wedding ring was looking as good as new? The day you were married just might be the last time you even thought of cleaning the ring. As gunk builds up, try to clean the ring at least once a month. Your ring is sure to look good and it definitely shows your commitment to the marriage. Details like this might keep your wife happy and surprised! First off, in order to clean your wedding ring with beer, it should not have any gemstones. You need a gold band. In addition, use a beer that is light gold. 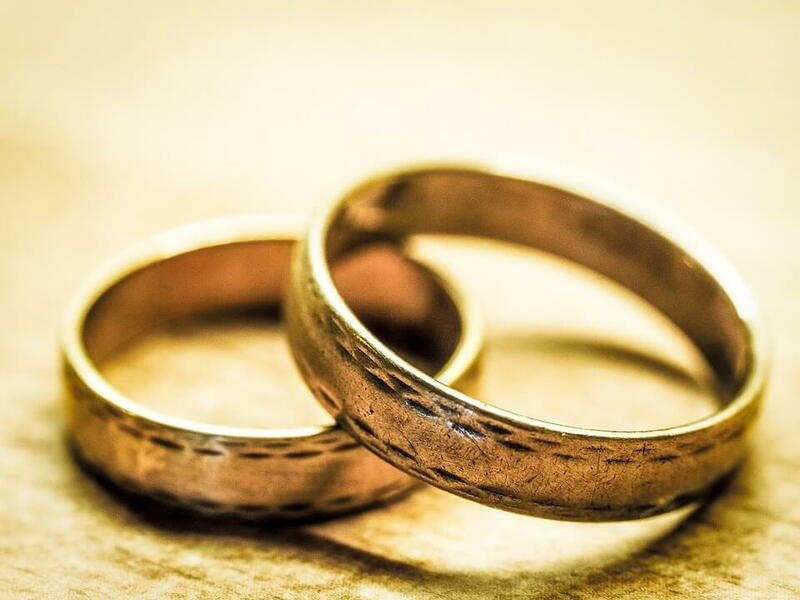 Darker brews may leave stains on the wedding band. Hops actually polish dirt and grime but too many may harm the band. This is why lighter colored beer is the right choice -- it gives you the benefits of hops but not without damaging the ring. Cleaning your wedding ring is simple. Simply drink the beer until you have a little bit left in the bottom. Pour the remaining liquid on the washcloth and rub the cloth all over your band. Dry your ring with a dry clean towel. Once clean, you'll see the difference in the look of your ring! This is how a real man cleans his wedding ring -- quickly, efficiently, and while sporting his boxer briefs. With a little bit of ketchup, your silver wedding band will look fresher than ever. The vinegar as well a the acids in tomatoes actually break down the gunk and dirt particles from your solid silver band. Ketchup is actually fairly strong, so watch out! Be sure to lightly brush the silver. It's better to go too easy than too rough on your silver wedding band. So how do you do it? Through the use of an old toothbrush, simply rub the ketchup gently on your wedding ring to scrub it. Once you've put the ketchup on your silver wedding band, be sure to rinse it thoroughly. Sure, your jeweler likely recommends bringing your ring in for a cleaning, especially if it has gemstones. One of the most efficient in-home ways to clean your wedding ring, whether it does or does not have gemstones, is to wear it while you are doing the dishes. Mild detergents uses in dish soap are easy on the gemstones but still break down particles on the surface of your band. To clean your wedding ring with gemstones, simply fill a cup with warm water and add a small squirt of dish soap. Drop in your ring for up to 40 minute of time. Once you pull the ring from the water, wipe off your ring and you'll see the difference. In cases where you do have gemstones, run a soft, used toothbrush over the stone to loosen up dirty trapped in the settings. Just like you drop Alka-Seltzer in water for yourself, simply fill an extra cup with warm water and drop two tablets in with the water. The chemical makeup of the medication actually loosens the dirt and grime on the ring. You'll be pleasantly surprised to see the results once your band is clean. Once you add the Alk-Seltzer to your warm water, drop in your band for 20 minutes. You actually get to see the fizz working on your ring! Underwear For Men proudly helps men be better men. Through our #ManhoodMoments campaign, we encourage men to share the moments in life that make them better men. Our US patented and Intl patents pending adjustable pouch underwear supports a guy for everyday, sport, work, and medical wear. We make boxer briefs with a 6-inch inseam and a 9-inch inseam as well as briefs. Underwear For Men makes underwear with a number of design features to support your manhood. From a tapered leg on your boxer briefs to moisture wicking material, you stay cool and comfortable with UFMs. We sell boxer briefs in seven colors including camo, black, gray, white, red, royal blue, and turquoise. This article topic was originally written by Men's Health Magazine as 'How To Clean Your Wedding Band Using Beer'.